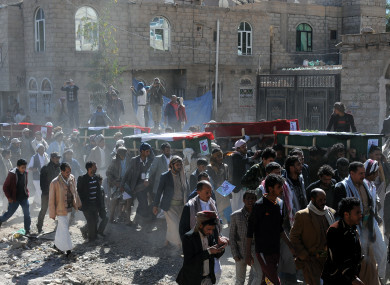 Yemeni people carry coffins of victims killed in airstrikes in Sanaa yesterday. SAUDI-LED AIR strikes killed 14 civilians in a village market near Yemen’s battleground third city Taez as a nearly three-year bombing campaign intensified, an official and medics said. The strikes also killed 11 rebel fighters and wounded 16 civilians, a local official loyal to the Saudi-backed government told AFP. The official, who asked not to be identified, said the strikes were intended as air support for a local revolt against the Huthi rebels in the village of Al-Haima, northeast of Taez, but the warplanes hit the wrong target. Taez is held by forces loyal to the Saudi-backed government but much of the surrounding countryside is in the hands of the rebels and it has been a key battleground in the country’s devastating civil war. To the west, on the Red Sea coast, Saudi-led air strikes killed 22 Huthis south of the key rebel-held port of Hodeida, military and medical sources said. The strikes targeted reinforcements sent by the Huthis from the rebel-held capital Sanaa, the sources said. Among the dead was Yasser al-Ahmar, a tribal chief, they added. The Saudi-led coalition launched its intervention in support of the internationally recognised government in March 2015. But despite its superior firepower, the rebels still control the capital and much of the north. The coalition has intensified its campaign since the rebels launched missiles at Riyadh on 4 November and 19 December. On Monday, 53 rebels and 12 government troops were killed in clashes and air strikes south of Hodeida. More than 8,750 people have been killed since the coalition’s intervention began, according to World Health Organisation figures. Email “Saudi-led air strikes kill 14 civilians in Yemen village market”. Feedback on “Saudi-led air strikes kill 14 civilians in Yemen village market”.